Direct replacement for Fender® Hardtail bridge - Vintage style. Designed to improve tone and sustain. Bridge plate is precision machined from solid Polished Stainless Steel plate. Saddles are precision stamped from Cold Rolled Steel. Polished and plated to enhance the look and feel of your instrument. 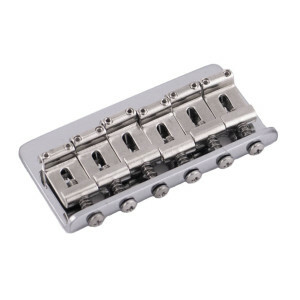 Bridge Plate – Precision machined from solid Polished Stainless Steel plate. Six (6) Stamped Steel Saddles, fully adjustable for height and intonation. Polished Plate give a comfortable, smooth yet vintage feel.